Steve Niles combines horror, noir, and science fiction in City of Dust #1 [Radical Comics; $3.99], the first of five issues about a future metropolis where the police protect citizens from...their imaginations. Now that's a change I can be afraid of. In the history of this future world, humans were consumed with strange superstitious beliefs. These beliefs - religions, if you will - led to wars which almost wiped out humanity. Religions and all other stories about "false heroes" and gods and other creatures were outlawed. Even a parent telling a simple bedtime story to his or her child could be imprisoned for life. That's what happened to the father of Philip Khrome after the seven-year-old innocently repeated one of his dad's stories to a classmate. All grown up, Khrome is now a detective charged to enforce the very laws that ripped his dad from him. He doesn't question these laws. He's an obedient child of the system. But, in a world where robots do most of the actual detective work, supernatural menaces are preying on mankind...and the robots aren't programmed to recognize these criminals. Khrome's world is about to change. Niles tells one heck of a story here and I can't wait to see where it goes from this debut. I'm not wild about the art - I'm a tough sell when it comes to painted comics art in general - but it was more a case of the art not helping the story much rather than actually hurting it. Despite my lack of enthusiasm for the look of the series, City of Dust #1 earns an impressive four out of five Tonys. 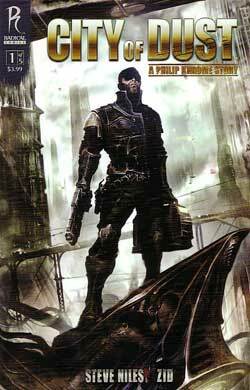 Adam Beechen has written fine scripts for DC Comics, but it's in his more individual work where he truly shines. 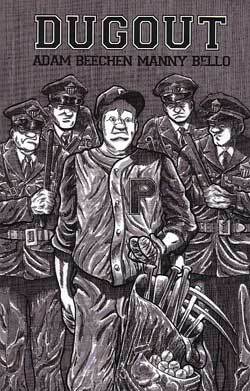 Dugout [AiT/Planet Lar; $12.95] is a surprisingly touching baseball story wrapped around a cool caper thriller. 1960. The Los Angeles Pioneers are the worst team in the big leagues, outmatched on the field and at the box office. Beset by the imminent loss of his job and his bone-crushing gambling debts, manager Cookie Palisetti has one chance to save his career and his limbs. He has to spring his star pitcher from prison. Palisetti's plan revolves around an expedition game with the prison team and an escape tunnel that's been four decades in the making. Add a cast of great lead and supporting characters on both sides of the fence, suspense on and off the field, a bit of romance, and the terrific black-and-white art of Manny Bello. The result? Beechen hits this one right out of the park. Dugout earns the full five Tonys. The Freak Brothers Omnibus [Knockabout; $35] is one of those must-have collections. The adventures of Gilbert Shelton's trio of hippie dopers have been reprinted in 15 languages and sold millions of copies - 40 and counting - across the world. Though these tales are of the 1960s and 1970s, they've aged exceedingly well for what they are: hilarious signposts of their era. They lack the immediacy of the Harold and Kumar movies, but they still have the power to make readers laugh out loud. This hefty tome collects every Freak Brothers story, related art, and a history of the strip. Though most of the stories are in black-and-white, there are also many full-color pages. Some of the pages will strain your eyes, they were originally done as tabloid-size pages for alternative/underground newspapers and reduced for this book - but that's a decent trade-off for the sheer magnitude of the 600-plus pages of material offered here. As much fun as you'll have revisiting or discovering Franklin, Phineas, Fat Freddy, and, of course, Fat Freddy's Cat, I recommend you take your time reading these stories. I shudder to think what a laughter overdose could do to my beloved readers. 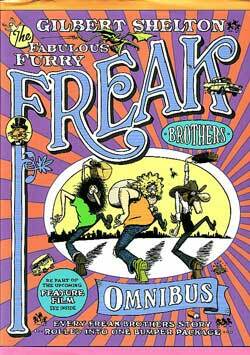 The Freak Brothers Omnibus easily earns the full five out of Tonys.